As a field, anthropology brings an explicit evolutionary approach to the study of human behavior. Each of anthropology's four main subfields - sociocultural, biological, archaeology, and linguistic anthropology - acknowledges that Homo sapiens has a long evolutionary history that must be acknowledged if one is to know what it means to be a human being (What is Anthropology?). The papers in this volume embody the view of anthropology explicit in the above statement. Behavioral ecology explains human behavior through the application of evolutionary theory in ecological context. It focuses on how behavior is influenced by the constraints of reproduction and resources acquisition. As a result, its purview is a wide swath of anthropology, especially economic anthropology. Human behavior varies through the life course, and humans make choices or exhibit behavioral variation depending on the costs, benefits, and constraints of local socioeconomic contexts. Pan-human conscious and unconscious processes generate these decisions, because over evolutionary time scales they produced, on average, behavior that increased the relative reproductive success of their bearers. Behavioral ecology examines these adaptive behavioral responses to local conditions. The volumes papers demonstrate behavioral ecology's maturation as a subfield of anthropology. They demonstrate the breadth of problems that can be gainfully addressed within the paradigm and the richness of specific hypotheses and data that this perspective can generate. 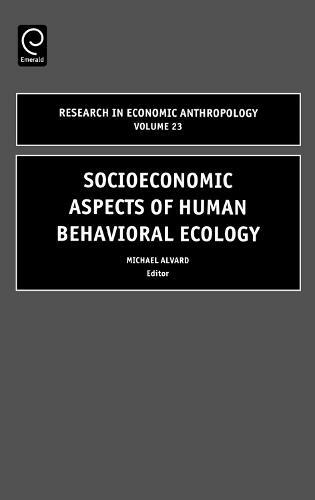 The papers also show how behavioral ecology conceptually integrates the core of biological anthropology with the other subdisciplines by providing a common framework for investigating and understanding basic economic questions.